Enjoy Rockpool Rambling the right way! An increase in fishing waste left illegally on Surf Coast beaches is impacting the environment and the community with one report of a dog swallowing a hook at Anglesea this week. 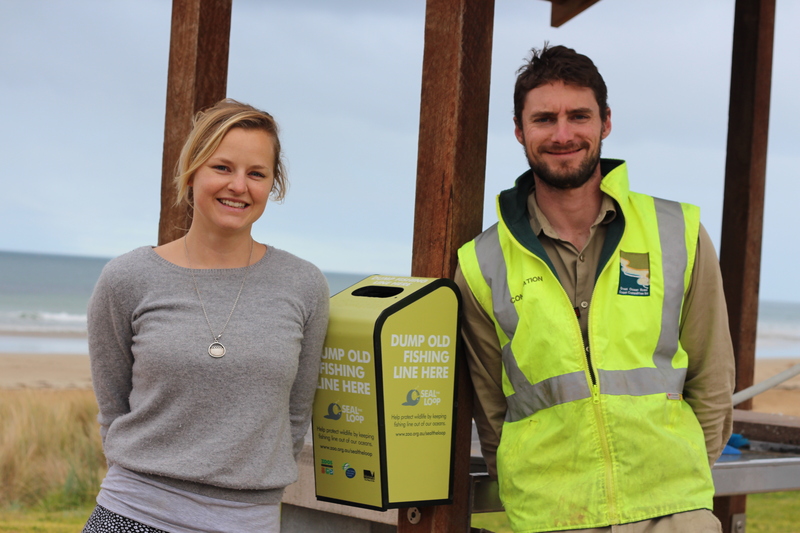 GORCC Environmental Projects Coordinator Alex MacDonald and GORCC Education Coordinator Pete Crowcroft with a Seal the Loop bin in Torquay. The Great Ocean Road Coast Committee (GORCC) has noted an increase in hooks, plastic bags, fishing line and other fishing-related waste, particularly in Jan Juc and Anglesea. GORCC Environmental Projects Coordinator Alex MacDonald said fishing waste not only impacts the coastal environment and marine animals, it is also harmful to beach users and animals. 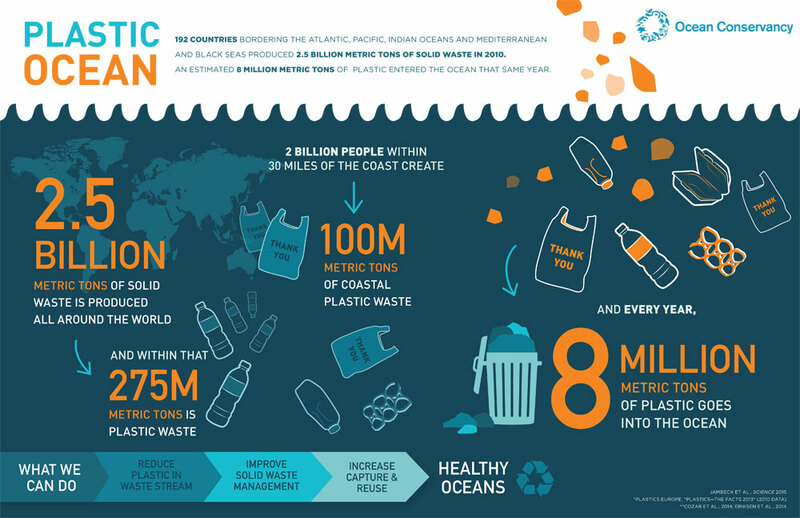 “This major source of pollution remains on the beach until it is washed directly into the ocean. “It is disappointing that a small number of individuals don’t respect the very environment they are drawing resources from,” she said. A visual representation of the quantity of marine debris in our precious waterways. Ms. MacDonald said that dogs could be drawn to hooks left on the beach, particularly when hooks were surrounded by discarded bait remains such as sardine heads and bones. “We have one report of a dog swallowing a hook at the Anglesea Main Beach and another report of a near miss,” she said. While the dog affected by the hook has been given the all clear, the incident serves as a timely reminder for all beach users to discard of waste properly. “Dispose your rubbish properly and care for the environment you came to enjoy. “GORCC urges all anglers and fisherman to take responsibility for their fishing waste and consider the safety of humans, pets, sea creatures and the protection of our coastal environment in general,” said Ms.MacDonald. 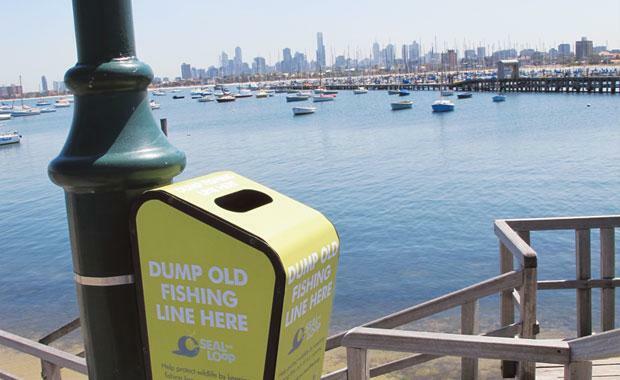 GORCC has installed Melbourne Zoo’s specially designed ‘Seal the Loop’ bins at multiple fishing locations along the coast. Seal the Loop bins have been placed in popular fishing areas all along the Victorian coastline. “The bins, which are made of recycled plastic waste, make it easy to dispose of fishing waste in a way that ensures it will never harm wildlife or beach users,” said Ms. MacDonald. GORCC currently has Seal the Loop bins at Torquay Main Beach, Torquay Point, near the Anglesea River, on the Lorne Pier and along the Lorne Foreshore. GORCC has recently applied for two additional Seal the Loop bins to be installed at the Jan Juc Surf Club car park and the Moggs Creek boardwalk. Keen fishermen and anglers wanting to make even more of a difference can take responsibility for their rubbish and take it home to be disposed properly off-site. More information can be found on the Seal the Loop website. New research has confirmed that an invasive species is rapidly adapting to different ecosystems along the coast, allowing it to spread fast and threatening the health of the marine environment. A team of Deakin University researchers have been studying the Northern Pacific Seastar (Asterias amurensis) in Australia to better understand its potential to expand its geographical range. The invasive seastar species originates from Japan and is a voracious predator which has a major impact on the marine food chain, devastating marine wildlife. Deakin University PhD student Mark Richardson has been conducting research to test whether its larvae have the ability to cope with elevated water temperatures, which may determine the seastar’s potential range. “The experiments have established that Northern Pacific Seastar larvae from Port Phillip Bay have several genetic differences that allow them to adapt to the local environment. “The same experiments were performed on native Japanese Northern Pacific Seastars to evaluate their genetic profiles and see whether the individuals living in Australia have developed greater tolerance to higher water temperatures. “The results indicate the Northern Pacific Seastars in Australia have a higher ability to thrive in elevated water temperatures compared to the native Japanese individuals”, Mr Richardson said. The heightened ability for the seastar to adapt to different water temperatures could pose a threat to the native marine wildlife along the East Coast of Australia. The Northern Pacific Seastar spreads through ocean currents and could infest waters eastwards from Port Phillip Bay along the coast. Project leader Dr. Craig Sherman from Deakin University’s School of Life and Environmental Sciences, said the experiments conducted on seastar larvae would improve understanding about this invasive species in Australia. 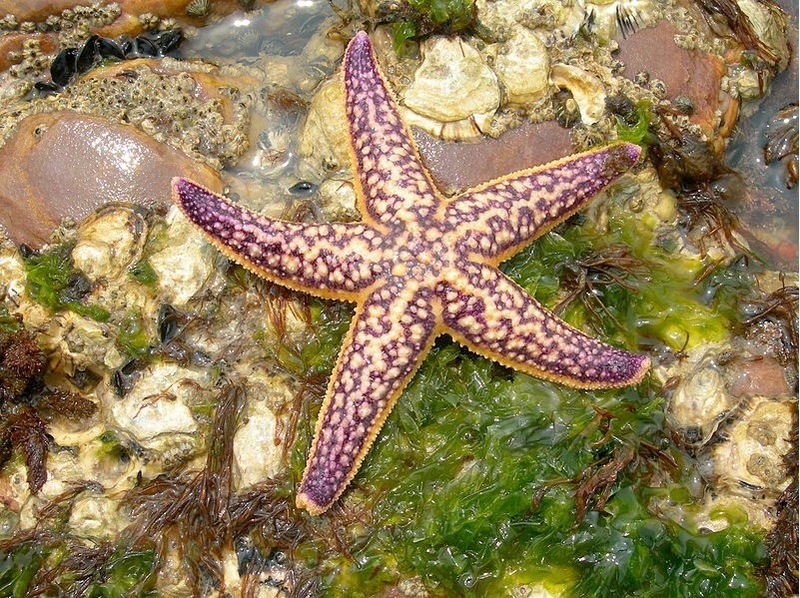 “From this research we have developed a better understanding about how seastar populations are connected and how this species is adapting and spreading along the coast. “We are interested in the ecological impacts the seastar is having on marine communities and the rapid evolution the seastar undertakes to survive in the environment,” said Dr Sherman. The water temperature research will be able to provide information for future marine pest management strategies in Australia. Marine pests threaten our local marine environments. 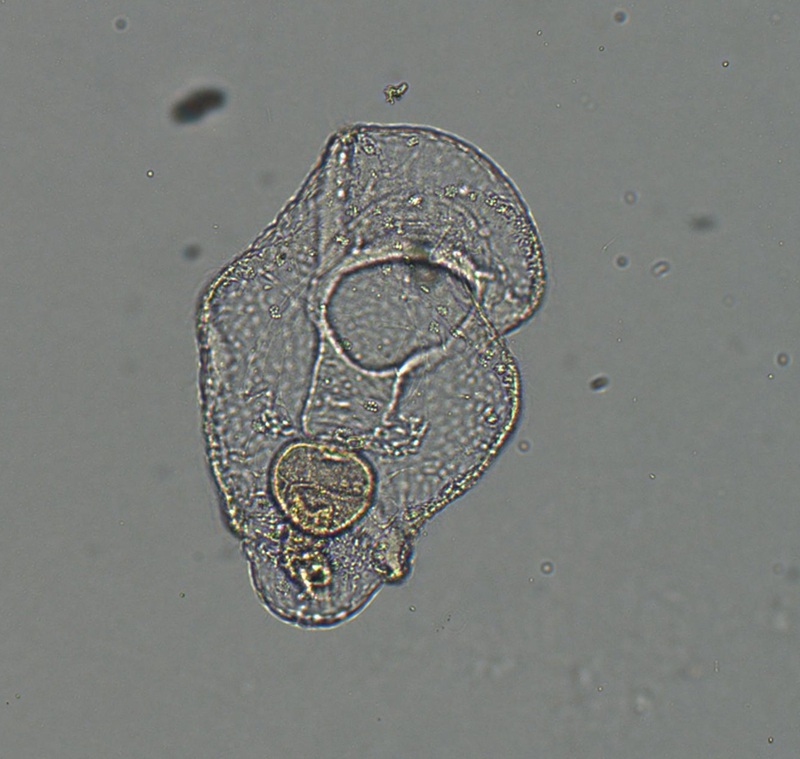 To find out more about what marine pests to look out for click here.